Although neurosurgery is one of the youngest surgical specialties, it is also the one that has undergone the most dramatic progress in recent years. As neurosurgery interfaces with other surgical areas, in particular ear, nose, throat specialty (ENT), ophthalmology and orthopedic surgery, new subspecialties have aroused such as: otoneurosurgery, neuro-ophthalmology and neuro-orthopedic spinal surgery. More particularly, new surgical approaches have appeared thanks to the improvements made in the areas of medical devices, imaging and information technology. Nonetheless, surgery of the nervous system and the spine still has to face therapeutic challenges, including the incurability of most cerebral tumors, low back pain and its socioeconomic impact, as well as the neurodisability associated with the evolution of a large number of afflictions of the nervous system. These challenges can only be addressed through a new technological revolution. For instance, Huntington's disease (HD) is an incurable neurodegenerative genetic disorder manifesting in adulthood and causing motor, psychiatric and cognitive disturbances. It is caused by a mutation in the huntingtin gene (htt), which at first leads to the degeneration of striatal GABAergic neurons and then to other neuronal areas. This mutation (mhtt) is involved in repression of several neuronal genes, particularly brain-derived neurotrophic factor. The use of trophic factors, targeting particularly BDNF in a neuronal protection strategy, may be particularly relevant for the treatment of HD where genetic screening can identify individuals at risk, providing a unique opportunity to intervene early in the onset of striatal degeneration. The "NBIC convergence" (convergence between Nanotechnology, Biotechnology, Information technology and Cognitive sciences) is a concept that appeared in 2002, in a report from the National Science Foundation. This concept appeared following a reflection on the potential impact of this convergence in the improvement of human capabilities, both at the individual and societal level. While this new concept, in particular its potential applications, has generated a philosophical and ethical debate, it has already been a source of progress in health technologies. For the first time, this e-book aims to depict the state of the art using nanotechnologies as a promising tool for therapy and diagnosis of neurodegenerative diseases. It focuses on anatomy and pathology of the main related-diseases, and gives a clear overview of the last advances in the so-called nanomedicine as to target the blood brain barrier or to image the brain defects accurately. All main issues linked to the development of new nanomedicine platforms (liposomes, targeting molecules, nanoconjugates…) and their fate, in vivo, (biopharmaceutical performances, interaction with biological media, toxicity…) are clearly presented with a translational approach. This e-book gives the reader a perfect overview of this very exciting field of medical research. It is intended to help scientists, technologists, and students who may use or need to use some aspects of nanomedicine in their work or who wish to be trained in this emerging and promising area of investigation. The era of nanomedicine is claimed to be effective now, in these years. But we experiment that is not true, in the field of medicine in particular. Obviously, there is a plethora of papers published in the major scientific and highly impacted journals, but it is not enough to claim clearly that medical application of nanotechnology is currently on the edge of technological approaches. Considering the brain, there are several pathological changes affecting the Central Nervous System (CNS): neurodegenerative (Alzheimer’s, Parkinson’s, retinal degeneration), neurological/neuropsychiatric (epilepsy, amyotrophic lateral sclerosis, autism), brain tumors (gliomas, astrocytomas, etc.) and rare neurometabolic disorders (i.e. inherited Lysosomal Storage Diseases), all considered major contributors to human death. Neurological disease management deeply impacts on patients health, care providers activity and represents a substantial socio-economic burden. Due to the absence of targeted and cost-effective therapies and limited diagnostic tools, the costs to the national health systems are high. For disease management, it is fundamental to achieve a deeper understanding of basic neurobiology underlying each distinct disorder and as an urgent unmet need, to develop novel targeted therapeutic strategies. Nanomedicine represents a powerful new approach providing novel carriers to deliver drugs to specific sites in the brain as well as to other organs (lung/liver/ breast/ tumor sites). Only a joint multidisciplinary research coordination effort can facilitate the full development of nanomedicine as valuable treatment and diagnosis strategy for these diseases. This book provides for the first step in order to “fill in the blanks” with a part of aspects which should be considered in order to produce and propose a real and applicable nanomedicine for the cure of neurodegenerative disorders and neurological diseases. With critical behavior and with deep knowledge, scientists of high experience and skills in their field of research or clinical settings analyzed different aspects of nanomedicine for brain delivery and targeting of drugs. 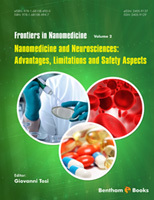 From the bases of neurodegenerative diseases as anatomy and pathology of brain disorders, this book opens to wide overview of the applications of nanosystem to brain disorders, addressed by means of application of nanomedicines to neuronopathic lysosomal storage disorders, or by the application of nanoparticles to target mitochondria in neurodegenerative diseases. Drug delivery to the brain by liposomal systems along with nanotopography sensing are also approached, together with the targeting of nanomedicine in mucopolysaccharidoses and brain compromission, along with the validation of drug nanoconjugates in vivo. Finally, safety aspects and benefit/risk focus is given by means of analysis of protein corona affecting the in vivo efficiency of polymeric NPs and neuroendocrine aspects of nanoparticles into neurodegeneration.